Ciarán Bolger is an entertainer, singer and guitarist from Garraí Árd in the village of Ardmore in Conamara. Learning whistle and traditional sean-nós singing at a young age, Ciarán developed a love and respect for the music tradition of Conamara. Focusing on guitar in his teens, Ciarán explored a mixture of traditional and contemporary music. This exploration has formed the basis for his emotive vocals and also his vibrant and expressive guitar style; drawing inspiration from a multitude of genres. 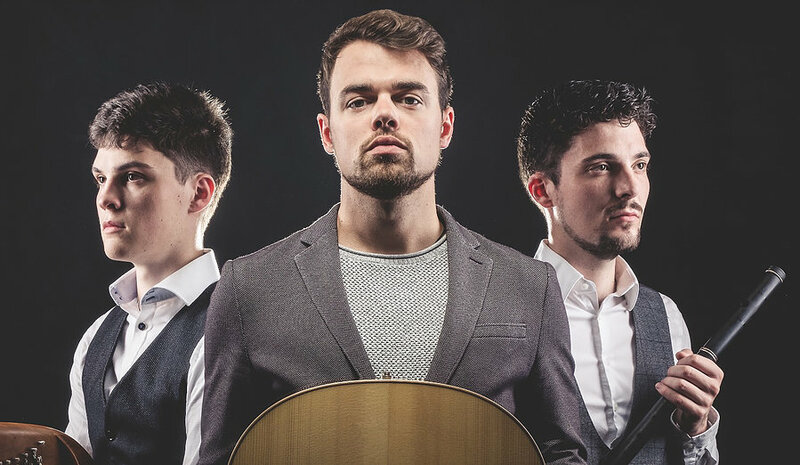 After studying Primary Teaching in Limerick, Ciarán spent some time teaching before taking up a residency commitment at Raglan Road Irish Pub in Downtown Disney, Disney World Orlando with his band ‘The West Coast Trio’ featuring Conall Flaherty and Ronan Canavan. Since then, he has spent many years performing and touring professionally with bands and Irish music and dance shows. Ciarán has toured in over a dozen countries with acclaimed Irish Music and Dance Show, Celtic Legends, performing in some of the most prestigious venues in Paris, Rio De Janeiro, Geneva and across the globe. More recently, Ciarán spent four months performing aboard the cruise ship, The Disney Magic, on the high seas with the Disney Cruise Line Company. Conall Flaherty is a multi-instrumentalist and singer hailing from South Connemara in the village of Ardmore. Growing up in an area famed for its musicians, singers and dancers, it wasn’t long before Conall turned to music and singing at the young age of four. He learned the ropes from neighbour, fellow flute player and maker, Marcus Hernon who also made the flutes which Conall plays today. Conall established himself as a flute and whistle player in the thriving session scene of Ireland performing his first gigs at aged fourteen. And through many years of playing, Conall has honed his craft and continues to adapt and push his style, tone and musicality to new heights. Conall plays in the style of South Connemara, also drawing from the more modern styles of today to leave us with a powerful and pulsating sound, and has been delighting listeners worldwide with his energetic and free flowing playing. He has also won numerous All-Ireland titles on both Flute and Sean-Nós Singing at the Fleadh Cheoil competitions. More recently, he has been found entertaining audiences throughout the U.S.A, Russia, China, Azerbaijan, England, France, Germany, Latvia, Lithuania, Estonia, Scotland, Wales and Switzerland since 2013, collaborating with Walt Disney World Orlando, Disney Cruise Line, Rhythm of the Dance, Dúlamán and Celtic Legends. Conall, and brother Séamus, have a unique musical bond and rapport that is a driving force at the heart of HighTime. Séamus Flaherty’s skills in dancing, singing and playing instruments reflect his personality. At only nineteen years old, Séamus meets each discipline with a passion and quiet zeal backed up by a love of the traditional Irish music heritage. Since the age of sixteen, he has been making waves in the fields of music, dance and singing across the globe; performing in China, U.S.A, Canada, The United Kingdom, Germany, Luxembourg, Belgium, Holland and France. He had the privilege of performing more recently alongside Cherish the Ladies at the world renowned Celtic Connections in 2017. Born into a family steeped in Irish traditional music, it wasn’t long before Séamus got his eager hands on the Tin Whistle, learning to play his first piece of music before developing into an accomplished multi-instrumentalist. An incredible twenty three time all Ireland champion on harp, whistle, singing and dancing, Séamus has performed on numerous tours across the globe, travelling extensively alongside other accomplished musicians, singers and dancers. Although only nineteen years of age, Séamus has made numerous television appearances, and has been featured in many radio programmes throughout his early musical career. Séamus is one of the few of his age responsible for maintaining the old style of Irish singing. “Sean-Nós” or “Old Style” singing, an ancient form of decorative Irish song, is of huge importance to him. He proudly boasts the beauty of this Irish art-form wherever he goes, delivering haunting renditions of poignant Irish folklore and mesmeric melodies to attentive audiences far and wide.